I recently had the opportunity to get my hands on a review copy of the new Star Trek fact book Star Trek FAQ: Everything left to Know About the First Voyages of the Starship Enterprise by Mark Clark, published earlier this year by Applause Theatre & Cinema Books. 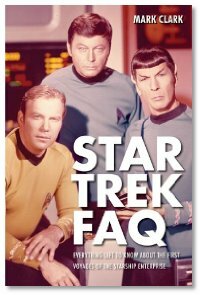 As a solid Trek fan I am always on the lookout for good books on the franchise, and Star Trek FAQ comes through in spades. Starting with Roddenberry’s early years and progressing through the series and fandom up to the first movie, the book provides a great amount of fascinating information about the origins of the series, the histories of the lead actors and the trials and tribulations in the early era of the series. One concern I had when I picked up the book was that there wouldn’t really be anything new. After all, how much new information could there possibly be to include. I was thrilled to find not only many new facts (including behind the scenes stories that aren’t usually talked about), but that they also support the text liberally with a variety of archival photos. 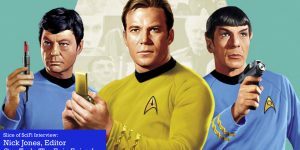 From classic promo pieces that we have all seen before, to more obscure items from the Trek past, there is plenty to see as well as read. The stories aren’t just limited to the main cast and crew, through the book you get a glimpse into the stories of many guests and even some of the red-shirts. In addition to the production of the show itself Clark spends a decent amount of time on the fan response from the original run, through the later building of the fandom leading up to the release of the first movie. The book doesn’t take itself too seriously either, with chapter and section headings that are word plays on episode titles and famous lines, the author does a marvelous job of steering away from dry delivery of facts and keeps the book interesting throughout. I would strongly recommend this book to fans of Star Trek, and I’m eagerly awaiting the next book (Star Trek FAQ 2.0: Everything Left to Know About the Next Generation, the Movies, and Beyond) which is due out in early summer 2013. 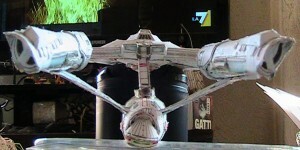 So please, give Star Trek FAQ a look, I’m sure you will enjoy it.